Surya Lanka Ayurveda Resort was opened in 1995 – one of the first Ayurveda hotels in Sri Lanka to cater exclusively to Panchakarma guests. It offers some of the most authentic Ayurveda in Sri Lanka, where guests can choose between the Ayurveda Light program, the Ayurveda Intensive program or the Ayurveda Heil program. Surya Lanka is known worldwide as a shining jewel among the Ayurveda Retreats in Sri Lanka, famous for its comprehensive classical Ayurveda treatment as well as for its exceptional care and generous hospitality. Situated on one of the most picturesque beaches in Sri Lanka, it is an oasis of relaxation for those Ayurveda guests looking for the the perfect Ayurveda Hotel to refresh their mind and body. In addition to the stunning beach-side location Surya Lanka also has two large palm fringed gardens, where guests relax in between Ayurveda treatments. There are also weekly organised activities such as Yoga, Afternoon Excursions, Panchakarma lectures and Botanical Tours of the Surya Lanka gardens. Add to this a well organised Ayurveda Centre, monitored by a highly professional and attentive team – which makes Surya Lanka Ayurveda Resort a recognised leader in the field of Ayurveda in Sri Lanka. 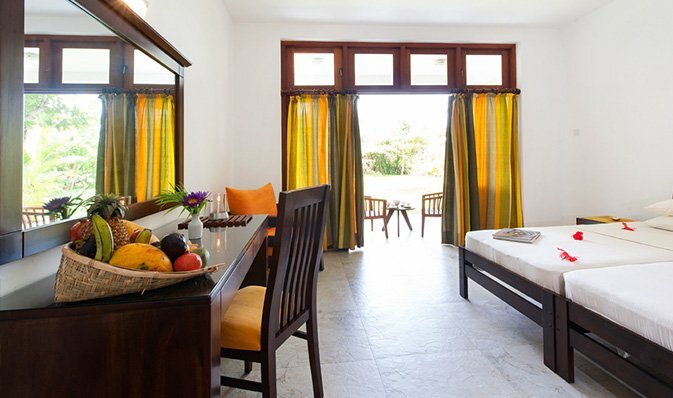 Surya Lanka was one of the first purpose-built Ayurveda Resorts in Sri Lanka, catering exclusively to Panchakarma guests. 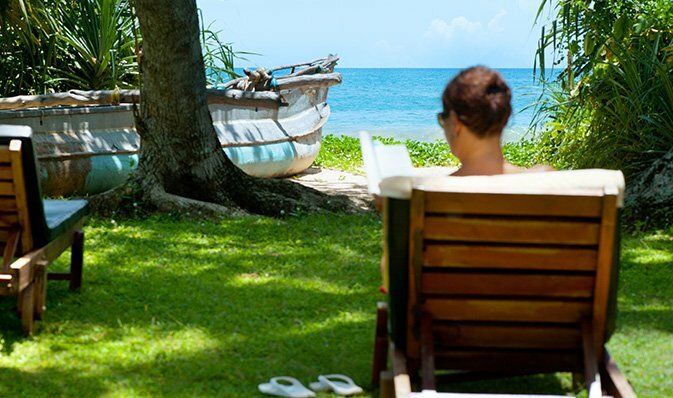 Established in 1995, Surya Lanka combines Western management with traditional Sri Lankan hospitality. Ayurveda has been successfully developed at Surya Lanka into a highly effective and respected medical system for guests seeking holistic well-being. Sri Lankan Ayurveda has been practiced for more than a thousand years, with it becoming increasingly popular amongst tourists in search of traditional Ayurveda Retreats. Ayurveda focuses on two main aspects – the removal of the causes of an illness and the active promotion of one’s good health and wellbeing. Ayurveda is unique in its holistic perspective of health, as it incorporates physical, mental and spiritual components. Ayurveda sets out to promote overall health through treating the cause of an illness rather than its symptoms. 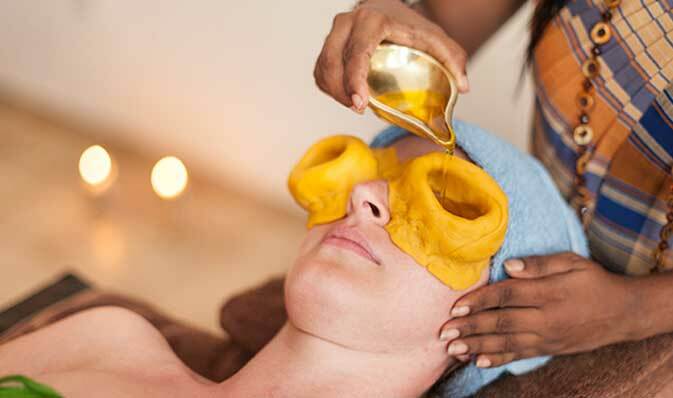 Surya Lanka offers three levels of Ayurveda Cure. The Intensive Ayurveda program delivers a complete detoxification of the body, and is the program chosen by approximately 80% of our guests. 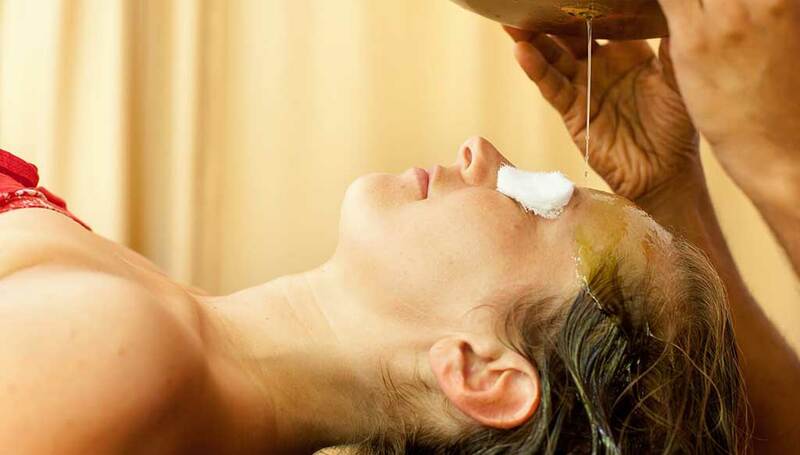 The Ayurveda Heil Cure is recommended for those guests with serious multiple ailments which require more intensive and specific treatments, more medicines and closer monitoring and observation. The Ayurveda Light Cure is recommended for those guests who want less intensive Ayurveda treatment with more time for leisure. Surya Lanka is known worldwide for its focus on authentic Panchakarma in Sri Lanka – the complete detoxification and rejuvenation of the body. The ultimate aim of Panchakarma is to restore total wellbeing through the removal of the cause of an illness and realigning the three bio-energies of Vata, Pitta and Kapha. At Surya Lanka, Panchakarma is strictly practiced according to the three stages of cleansing prescribed in the original Ayurvedic texts – Purvakarma (Pre-treatment), Pradhanakarma (Primary-treatment) and Pashtakarma (Post-Treatment). Surya Lanka has the perfect environment for Yoga in Sri Lanka. Yoga is increasing in popularity within Sri Lanka as well as throughout the world, as more and more people become aware of the benefits to mind and body through its regular practice. Yoga is an essential element of the Ayurvedic way of life to achieve harmony and balance of body, mind and soul. 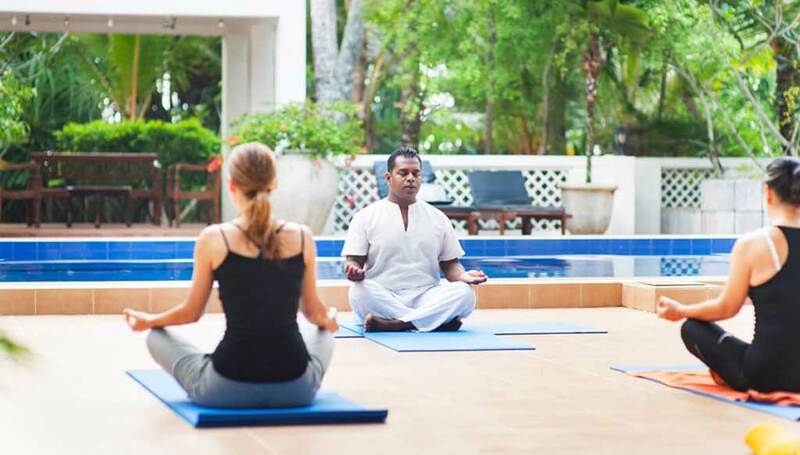 At Surya Lanka, guests are offered 10 classes of yoga a week – 5 days, in the morning and in the evening. The Yoga sessions are designed in part for beginners and partly for advanced yoga practitioners. Our Ayurveda Retreat boasts one of the most coveted locations along the southern coast of Sri Lanka, with direct beach frontage to the stunning Talalla Bay. 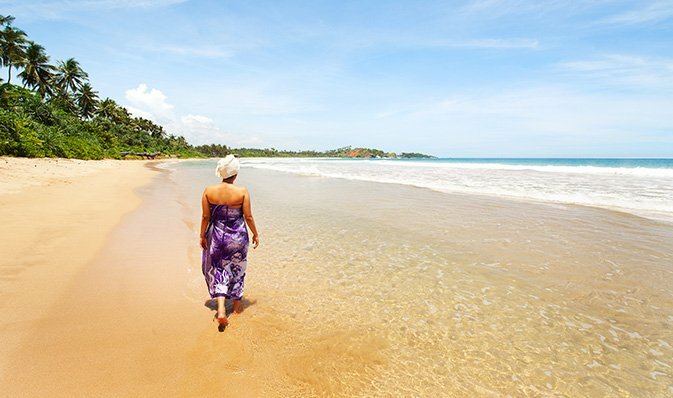 Talalla is an ideal location for an Ayurveda Resort in Sri Lanka – a 1 km golden sandy beach which is perfect for Sunrise/Sunset strolls as well as ideal for swimming during the European winter. Surya Lanka itself is built upon a former coconut estate, where even today guests can relax in the shade of the palm trees between treatments or whilst dining outside in the Al-fresco dining area. Surya Lanka was purpose built as an Ayurveda hotel, exclusively for the use of Ayurveda guests. Its 43 rooms are spread out over five separate buildings in an expansive property in order to ensure maximum privacy and quiet. Choose between Standard, Beach and New Wing rooms, all containing large balconies or terraces, with Sea and/or Garden Views. 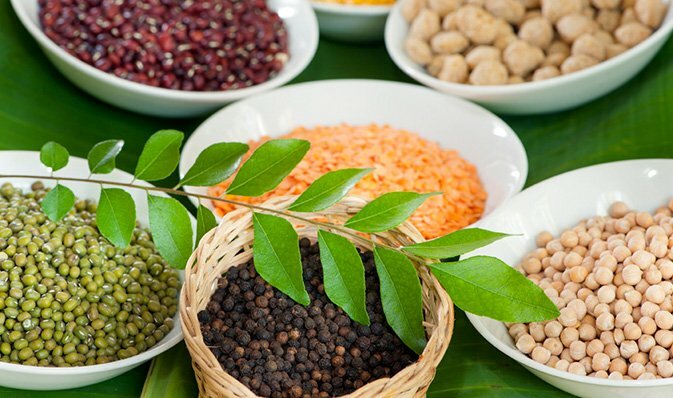 In Ayurveda, nutrition is viewed not only as pleasure, but also as medicine for both the body and the spirit. It is an important component both in the Panchakarma detoxification process and in order to maintain the resultant optimum health. At Surya Lanka the doctors and the kitchen staff closely monitor each guest’s diet in order to ensure that Ayurveda diet principles are strictly observed. Guests are also able to partake in the weekly cooking demonstration, where they can learn first-hand how to prepare traditional Sri Lankan food. Each guest’s Ayurveda program at Surya Lanka begins with an Initial consultation with the Ayurveda Doctor. It is the basis of your Ayurveda program, as it provides the information required for the Doctors to devise the best line of management for your specific medical needs. This is followed by a Mid consultation, which is a formal assessment of the progress of your Ayurveda cure, and the Final Consultation where the doctors give advice on how to extend the benefits gained from your Ayurveda program. Surya Lanka offers a weekly Excursion for guests’ to get a glimpse of the Sri Lankan way of life and showcase the country’s culture during their Ayurveda holiday. These excursions are rotated between a visit to the Galle Fort – a UNESCO world heritage site built in 1588 by the Portugese, a visit to a Tea Plantation and a visit to the Mulkirigala Temple – a rock temple which dates back to the 3rd Century AD.